Wall Street is a collection of many things. In the modern markets, at times it seems as if Wall Street is nothing more than a collection of computers. The computers buy and sell from each other, driving volume to record levels and seeking profits of less than a penny a share. But, there has to be someone behind those computers. It takes large firms to fund the programming efforts. These same firms need to fund the trading of the machines. They also need to have people who give the programmers instructions and who approve the code. The people of Wall Street are still there, maybe not standing alongside the computers but definitely holding positions behind them. And, many of the people behind the computers are similar to the traders who have roamed Wall Street for generations. To a large extent, the computers are simply the next iteration of trader. This can be seen at times when the computers seem to be acting like old Wall Street traders. It almost looked like one of Wall Street’s most popular old sayings was programmed for action this week. Traders have long said, “buy the rumor, sell the news.” This week, that appears to be what happened to Telsa Motors, Inc. (NasdaqL TSLA), the electric car maker. Tesla announced it would meet a major milestone in July. 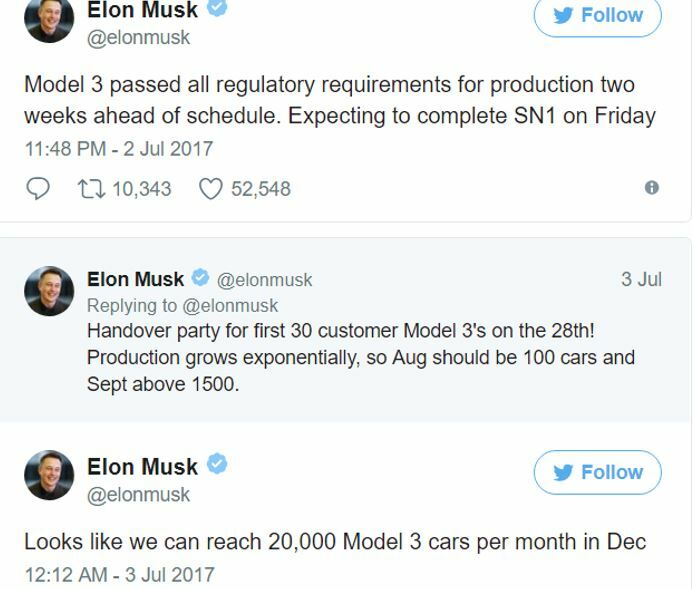 CEO Elon Musk announced the news in a series of tweets. The Model 3 is scheduled to be Tesla’s first mass-market car. Many analysts believe it is the company’s most important product since it moves Tesla from a niche producer to an actual car company. The Model 3 was announced in March 2016 and is priced at $35,000, before incentives. The car is expected to have a range of at least 215 miles when it is fully charged. The company’s future certainly seems to depend on the Model 3. Tesla plans on producing 500,000 of these cars a year by 2018 with production soaring to 1 million a year by 2020. The mass market Model 3 is expected to be the company’s top seller. Consumers seem to be enthusiastically awaiting delivery. Last year, Tesla reported receiving about 400,000 preorders for the Model 3. Since the last update, it is probable that the number of orders has increased. While consumers may be excited about deliveries, Wall Street seems less enthused. The stock price fell sharply after Musk’s announcement. Wall Street Traders have always been able to explain complex thoughts in simple phrases. In the 1800s, war was more common than it is today. At that time, traders would say, “buy on the sound of cannons, sell on the sound of trumpets.” This saying dates back to the Napoleonic Wars. Traders noticed that at the start of a war, when the sounds of cannons roared, there was panic associated with uncertainty. Usually, there was a down move in the markets as the armies met for the first time in battle. This sell off often turned out to be a buying opportunity in hindsight. As the war ended, trumpet sounds would fill the streets as the armies paraded home. This was when many individual investors would start buying but the smart money had already accumulated positions in the panic and was selling at this point. As the frequency of war declined, traders adapted the saying to buy on rumors and sell on news. This would certainly have worked for Tesla. Deliveries move the company to the next phase. Tesla is no longer going to be able to trade on hope that consumers will line up to buy electric cars. The products will now be available and investors will value the company based on consumer response to the product rather than promises of profits to come. Tesla has been losing money since the company began trading in 2010. Accumulated losses now top $3.3 billion. This year, analysts expect the company to report a loss of $5.78 per share. The loss is expected to narrow to $0.74 in 2018 and a profit of $5.70 is expected in 2020. The expected profit coincides with Tesla’s goal of producing 1 million cars per year. Months ago, that production level was a loft goal. Now, there is an announced ramp up plan and the company is under pressure to deliver cars, and financial results that meet expectations. Using the 2020 expected earnings, shares of Tesla appear to be significantly overvalued. On average, auto makers are trading with a price to earnings (P/E) ratio of 15.3. This is well above the industry’s long term average P/E ratio of 13.2. To be optimistic, Tesla can be valued with the elevated P/E ratio. At 15.3 times expected 2020 earnings per share of $5.70, the price target for the stock would be $87.21. Even a price target of twice that level would be well below the current price of the stock. To benefit from the expected decline, traders could buy a put option. However, put options are relatively expensive in TSLA. The risk of buying an expensive put is a 100% loss of capital if the stock defies expectations and rises. In the past, Tesla has consistently defied expectations and rallied. 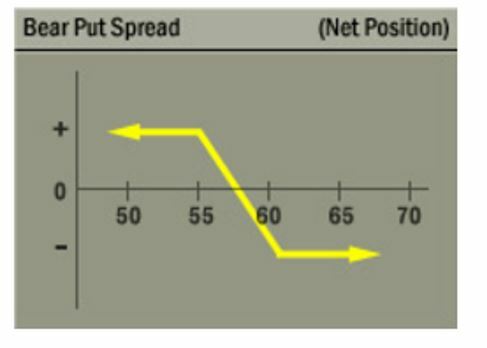 A bear put spread strategy can be used to limit the risk. This strategy profits from a near term decline in the underlying stock with limited risk. The bear put spread consists of buying one put and selling another put, at a lower exercise price, to offset part of the cost of buying the first put. The spread generally profits if the stock price moves lower. The potential profit is limited, but so is the risk should the stock unexpectedly rally. The risks and potential rewards are summarized in the chart below which is from The Options Industry Council web site. For Tesla, the decline in likely to unfold over months. That means profits can be compounded with a series of short term trades. The first trade can use options expiring later this month. TSLA closed on Thursday at $309.75. There is a July 21 $285 put trading at about $4.65. Each contract covers 100 shares so the cost of this option would be about $465, ignoring commissions which are small at deep discount brokers. To offset the cost of this trade and limit the risk, a July 21 $280 put could be sold. This put is trading at about $3.42 or $342 per contract. This results in a debit of $123 which is the difference between the two contracts. This is the maximum risk on the trade. If TSLA is below $285 when the option expires, the maximum potential profit is equal to the difference in the strike prices less the premium paid. In this trade, the maximum profit is equal to $377. This is the $5 difference between strike prices (multiplied by 100) minus the $123 debit. The debit bear put spread is a low cost, low risk strategy to benefit from a price decline. When the decline is expected to last for some time, as it is with TSLA, the strategy can be used multiple times. When the July options expire, a new trade using August or September put options can be implemented. In this way, traders can benefit from the trend as long it lasts. When the trend reverses, other strategies can then be used to benefit from the up side. But, for TSLA, the potential upside could be months away, especially if the company fails to deliver cars on schedule or if consumers are disappointed with the product they have waited more than a year to see.